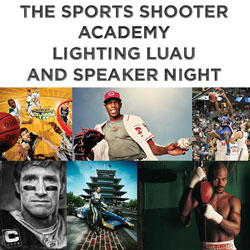 I will be teaching and speaking at The Sports Shooter Academy Lighting Luau on April 22nd. Joining me is Robert Beck, a super talented Sports Illustrated shooter and inspirational speaker. Please join us at the Crowne Plaza Orange County Airport Hotel from 7:30-10:00 for the evening lecture. Robert and I will each speak for about a hour and half. The daytime workshop is sold out, but there is still room for the evening. Tickets and info at http://www.samys.com/index/page/product/product_id/48579. A special thanks to Samy's for supporting this event and to Robert Hanashiro for the invite. I also will be participating in PechaKucha night, Volume 11, in San Diego on April 20th at the W Hotel. There will be 7 guest speakers, from a wide range of professions, for this unique event hosted by the San Diego Architectural Foundation. PechaKucha Night was devised in Tokyo in 2003 as an event for young designers to meet and show their work. It has spread around the globe and is now thriving in San Diego. The name comes from the sound for "chit chat" and the presentation format is simple: each speaker shows 20 images for 20 seconds each. I will be presenting 20 images from my personal project, Behind Photographs. You can find out more here, http://www.pecha-kucha.org/night/san-diego/11. This evening is more of a social event with a lecture in the mix!